Welcome to the website for Oriel Produce and Floral. On this website you will find information about our products and services. 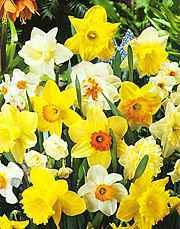 At the moment we have information about our huge stock of Daffodils. Click the Daffodils button at the left to access the catalogue. Coming soon, we will have information on our stock of Bulbs, Pinks, Roses, Tulips, Mushrooms and other products. If you have any questions at all, please contact us at the numbers above.